You’re probably aware of the many ways in which tobacco use affects your health, but are you aware of some of the global issues associated with tobacco production? Children as young as five years old are working 12-hour days on Malawi’s tobacco farms without protective clothing and are exposed to high levels of nicotine poisoning, the equivalent of 50 cigarettes per day. 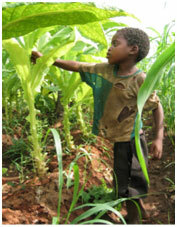 It is estimated that more than 78,000 children work on tobacco estates across Malawi for less than 1.7 cents per hour. Children are showing signs of Green Tobacco Sickness and report headaches, shortness of breath and muscle weakness among other symptoms. Tobacco farms in America declined by 89% between 1954 and 2002. Three-quarters of production has migrated to developing countries, with Malawi being the world’s fifth biggest producer. Still there are other atrocities associated with the tobacco industry. Bonded labor, though illegal, is common in India. This happens when a family has to borrow money for an emergency and is unable to repay the loan. In order to pay off the debt, a family member must work to pay it off. Often times the children are the only ones who can be spared from the regular income generating work. They sometimes work years to repay the debt. Children in Mexico often work alongside parents to generate enough income for the family.